There are a lot of project management conferences in 2016. This list of project management conferences is broadly Europe-centric because that’s where I am and what I know best – and therefore feel most confident recommending. However, I have tried to include a range of locations so you’ll be able to find a 2016 conference close to you. Scroll down to the bottom for a free email 3-part mini-course on How To Get The Most Out of a Conference. It will show you everything you need to do before, during and after a conference to maximise your return on investment and benefit the most from whichever event you are going to. It’s free! APM was awarded the Best Association Conference in London last year, so the annual APM Conference is well-recognised as an exceptional event. I can vouch for that, actually. I wasn’t there last year but I have attended, and spoken at one of the previous conferences (a long time ago). It’s going to be at King’s Place in London this year, which makes it very central, even for people arriving from continental Europe. You don’t have to be a member of APM to attend. The PMI Global Congress—EMEA is off to Spain this year, to the beautiful seaside city of Barcelona. I’ll be presenting at a panel debate on digitisation and technical advances in project management, and launching my new book. Last year’s EMEA event in London was really good. Watch the highlights from Day 3 in this video to give you an idea of what the Barcelona event is going to be like. This year’s Project Management in Practice conference focuses on developing project management competencies. It’s hosted by Boston University Metropolitan College and blends together the academic and practitioner communities, making it unique amongst project management events. At the time of writing the conference programme is still being finalised and wasn’t available on the event website. You can see what happened at last year’s conference though, to get a feel for what sort of things are going to be discussed. I know a couple of people who attended and had very complimentary things to say about the 2015 conference. The UK’s major event on project controls is in its 21st year, making it one of the longest-running conferences that I am aware of. EVM is going to be an ISO standard and while that will no doubt get a mention in the agenda, don’t expect the event to be too preoccupied with the technical management of projects. Last year I did expect that – and was pleasantly surprised at the wide mix of talks. I gave a presentation on Overcoming Imposter Syndrome and there were presentations on diversity in leadership, managing difficult stakeholders, project ethics and governance. Here are some photos from the 2015 event, showcasing the amazing Armourer’s Hall venue in central London. Held in Accra at the Movenpick Ambassador Hotel, PMI’s major African project management conference has the theme of greater business results through project management. The website has all the details now. PMI New Zealand Chapter’s conference will be in Auckland this year. It’s likely to be in September. Keep an eye on the New Zealand Project Management Conference website for more details. Last year the theme was ‘Shape the Future’ and over 400 attendees did that over 3 days in Wellington. There were also site visits to major project sites and local attractions – they know how to look after the delegates! The APM’s Women in Project Management event is well-known now as one of the best SIG conferences in the UK that is put together entirely by volunteers. Last year I attended as part of a panel debate on networking. There is something special about attending an event that is put together by women for women in project management. Last year we also had a lively debate about whether the event was needed – do female project managers need a space to meet together and discuss issues related to them? Or are the issues to do with project management as a job as a whole? The conclusion was that we did want to keep the event. (Men aren’t excluded from attending, by the way, and there were some there last year, both presenting, debating and as delegates). The exact date hasn’t yet been finalised so watch the SIG website for the announcement. It’s likely to be in September. Here’s one of the presentations from 2015. PM South Africa holds a biennial national conference. There aren’t details yet on the PMSA website but you can browse through the details for the 3-day 2014 event to get a feel for what the conference will cover. It’s later than last year (when it was in June) and the PMI Netherlands Chapter is hosting their annual summit in the same location as 2015. Details of the programme haven’t yet been released but you should expect a mix of local and international speakers. The event aims to inspire and to be inspired. I didn’t make it to the North America PMI Global Congress last year and frankly I don’t know when I next will. It’s a long way to go and it’s expensive. But if you are local it’s definitely worth it. There is so much to do and learn, plus everything is included. Networking events make it easy to meet people if you are going alone. Plus you’ll leave feeling like you really do have the best job in the world. This year it is in California, and a bit earlier than the normal October slot. The inaugural Australian Institute of Project Management Regional Conference takes place in Sydney, Australia this year. It will focus on issues relevant to the Asia-Pacific region with the theme of “Project Management: Delivering Capabilities”. There’s more information on the AIPM website. PMI Hungary Chapter’s annual conference is held in English and is normally around International Project Management Day in November. It’s worth going just to see the amazing venue, probably the most modern and stylish venue I have ever given a presentation in. Last year’s event also included a Masterclass and a special DecisionLAb workshop, both aimed at giving project managers the chance for a more indepth investigation into topics. The Chapter members I met were amongst the most organised and gracious project managers I have come across. Learn more about my experiences in Hungary when I spoke at this event in 2014. 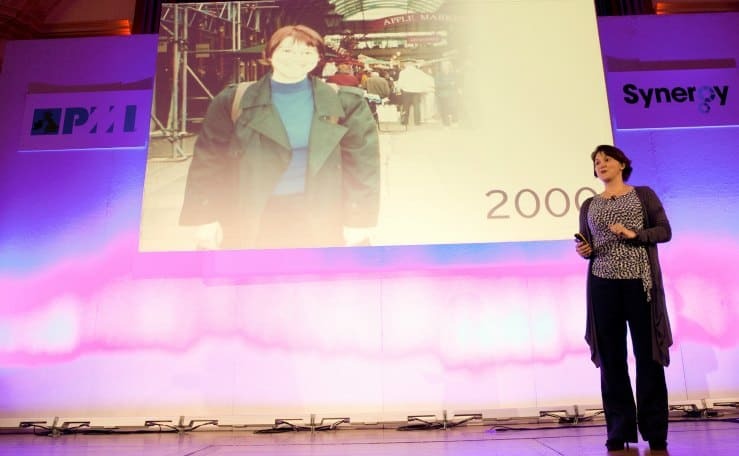 Last year I was lucky enough to be asked to speak at PMI UK’s flagship annual event. It was incredibly nerve-wracking, but hugely inspiring and a fantastic opportunity. I think my presentation went off as well as I could have hoped for and I was really pleased by the audience’s reaction. The event is normally held around International Project Management Day and it traditionally only has one track, meaning everyone experiences the same presentations. It gets better every year – last year they even managed to get everyone fed in the break with a brown bag lunchH which was a big improvement on previous events. Here’s me on the stage at Central Hall Westminster giving my Synergy presentation. Watch the website for details of the early bird pricing. This event has only just happened so let’s give the organisers a break before expecting the website to be updated with the details for next year. It’s an event that attracts around 1500 practitioners and delegates from the region and further afield. Having met one of the organisers earlier this year I know that this is a professionally-organised and well-supported event. Plus they’ve made the graphic recordings of the 2015 event available to download on the forum website! Awesome. Project Zone Congress isn’t included on the above list as I can’t find any indication that Stamford Global are running it again this year (or the Nordic version). If that is the case, it’s a pity, as it was an event that attracted excellent practitioner speakers sharing real-live examples of project successes and challenges. Wherever you are in the world you’ll find a project management conference, seminar or event. Conferences sponsored or hosted by national project management associations tend to be good quality and aimed at practitioners, so if there’s nothing on this list that you can attend, look for something local to you. You can gain a lot by attending a conference, so make time for networking and learning in 2016! This free email mini-course tells you exactly what to do before, during and after a conference to maximise your attendance and get the most out of your conference fees! Enter your email below to sign up. Read my privacy notice. 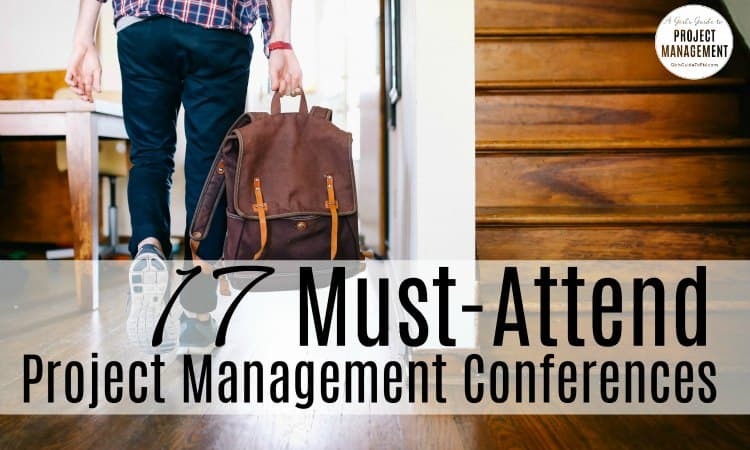 I want to add 10 important project management Conferences which is present on my blog. These factors must be attended in 2017. Thanks, Zubair. There are some good ones in here! Thanks for mentioning that one, Raymond! Elizabeth, I have heard good things about that event too. Thanks for mentioning it! I have had a look and they also have Bruno Kahne speaking – I bought his book after I heard him talk last year so it’s worth going for his talk alone! The Conf is shaping up to be a really exciting event with global input and reach. Worth noting that Early Birds ends 31st Jan – get in quick! The Association for Project Management organises some 200 events around the UK every year, many of which are free to attend for members. For details of upcoming events please visit http://www.apm.org.uk/events – we look forward to meeting you soon! Thanks, Anna. The APM has some amazing events each year, small and big. Don’t forget the Resource Planning Summit in NYC on May 23 and 24! NYC – it has been a while since I’ve been there! Thanks for pointing that one out Julie.